Man and Superman was the first drama to be broadcast on the BBC's Third Program on October 1, 1946. To celebrate Radio 3's fiftieth anniversary, the play was directed by Sir Peter Hall, and preserved for all time in this lush audio dramatization. 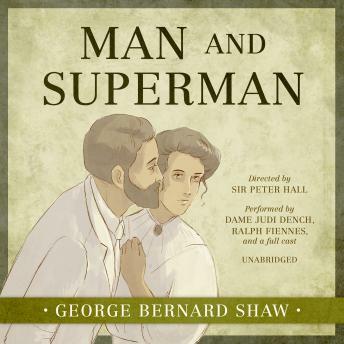 "A comedy and a philosophy," Man and Superman is based on the Don Juan theme, and using all the elements from Mozart's Don Giovanni, Shaw reordered them so that Don Juan becomes the quarry instead of the huntsman.Boasting an outstanding cast including Ralph Fiennes, Juliet Stevenson, Dame Judi Dench, John Wood, Nicholas Le Prevost, and Paul Merton, this release includes an exclusive interview with director Sir Peter Hall.